It is quite clear that this is going to be Asia’s century. The opening of China, the rise of India and the resurgence of Asia make the region the most vibrant business playing ground in the world. There is a slow but steady shift in the Asian business mindset. Gone are the days when low cost and manufacturing prowess alone served as the only competitive advantages for the Asian companies. The Asian corporations must realize the importance of moving up the value chain. The Asian business landscape requires a different path for Asian companies and their boardrooms to be successful. Companies need to achieve a fine balance between low-cost production (competitiveness), constant innovation (differentiation) and enhanced customer satisfaction (value capture through branding). Even today, the majority of Asian companies still function with a trading mindset where short-term sales and investments in tangible capital assets are predominant as opposed to investment in intangible assets like brands. A study carried out by McKinsey shows that tangible assets are becoming less relevant in Asia’s battle for global success. It shows that the biggest value creators of Asia have a 1:1 sales to asset ratio as against a 1:4 sales to asset ratio for an average Asian company. Going ahead, Asian boardrooms need to realize the importance of intangible assets and invest in them. Brand building costs a considerable amount of money. Global brands have been able to reap scale economies by combining their branding expenses across their many related business units. Asia however, is still dominated by large conglomerates that have diversified interests in many companies. This disables Asian companies from reaping any scale economies in their branding investments. Another McKinsey study shows that 90% of Asia’s value creators derive more than 80% of their revenues by focusing their businesses in one industry sector. Moreover, these companies focus on intangibles like fostering human capital, exploiting network effects and creating synergies based on brands and reputation rather than investing in physical assets. Therefore, branding and brands are becoming increasingly important for the future success of Asian businesses. This will require a different toolbox and knowledge base from Asian executives – not the least from the CEO. Global companies have built brands for many decades and mostly been very successful with it. Japan and Korea also caught up early building their own brands in form of SONY, Toyota, Samsung, LG and others. But the rest of Asia generally lacks behind in branding and many of these Asian businesses are foregoing value at the expense of their shareholders. Brands are not only, if sometimes at all, built from traditional advertising and promotions, but are rather built using a comprehensive range of corporate-wide activities delivered by people throughout the organization. Therefore, the crucial balance between brand promise and brand delivery has implications for all company functions and it becomes a managerial responsibility reaching far beyond marketing and communications departments. Therefore, branding can no longer be delegated to the mid-level marketing function in the typical Asian organization. Instead, the Asian boardrooms and the CEO must take charge of the brand strategy, lead the brand development, manage its implementation and be fully involved in performance tracking and benchmarking. The branding process cannot reach its logical conclusion unless the chairman and the CEO buy into it and back it up with the required resources. But merely having the branding knowledge will not suffice. Leaders need to have a holistic vision and an in-depth understanding of the discipline. One also has to be an excellent business leader and brand marketer with a truly international edge. Asian boardrooms have traditionally been the playing fields for technology and finance professionals, and most directors either have technology, operations or finance backgrounds. Going ahead, these capabilities alone will not be sufficient for sustained growth and enhanced shareholder value. With branding taking the centre stage, it is extremely crucial that the boardroom represents brand capabilities and experiences to ensure that brand guardianship is practiced at the highest level. Firstly, education and training of the boardroom directors can bring them up to a common understanding of the discipline, its opportunities and challenges. Secondly, the company can elevate people with strong marketing and branding backgrounds to the board. Asian brands can indeed challenge the global players, but it requires a new mindset, resources and capabilities. The marketing and communications departments do not have managerial authority over the other company functions. For example, if the service level of the front staff of an airline is sliding according to surveys, it could quickly deteriorate the brand promise. But the marketing department will find it difficult to exercise authority to implement any necessary actions. They will only be able to influence the process. The internal political complications could be significant and the time to action can be relatively slow. This example shows the importance of boardroom and corporate management responsibilities, and carry ultimate weight when being led by the CEO. The CEO and the CFO have until now been the typical inseparable, influential and strongly coordinated twins running the company. Therefore, branding should be represented at the boardroom by a person, The Chief Marketing Officer (CMO), responsible for branding so that he/she is able to participate equally with corporate executives like the CEO and CFO. The CMO is an emerging trend in Western boardrooms where the marketing function is increasingly represented at C-level along with the CEO and CFO to provide a better representation for marketing and branding at the boardroom level. Think about the following example of marketing’s role within the organisation: When Asian companies disclose financial results and forecasts for the future to analysts and media, the spokespersons are usually the CEO and even more often the CFO. But what are the drivers of the future revenues? One of the three key drivers for Asian companies going ahead is the ability to capture value by closely linking it to customer satisfaction and the price premium the brand is able to command. The CFO is rarely a savvy marketer and lacks a detailed knowledge of or any in-depth experience in branding. Instead, a senior and strategic marketing person, the CMO, would be most appropriate and capable to address that crucial aspect of the corporations’ future objectives and how it helps driving profitability and financial value. This highlights the need to train the marketing staff or to hire external marketing talent to ensure branding skill-sets and experiences are sufficient on a strategic level. Naturally, there is a limit to the direct involvement and supervision of the CEO in managing the marketing and branding activities. To ensure his continuous involvement in branding despite his other responsibilities, the CEO must be backed by a strong brand management team of senior contributors, who can facilitate a continuous development and integration of the brand strategy. The CMO can serve as the crucial (and often missing) link in the Asian boardroom. It enables the corporate management to directly design and control the brand strategy, and also to allocate the required resources to successfully implement the strategies. The company can also gain significant advantages by creating a Brand Board chaired by the CEO and led by the Chief Marketing Officer. This creates the missing connection between the boardroom (corporate management) and the marketing function (implementation of brand strategy). The key people from all relevant departments should be represented in the Brand Board including staff from the marketing department. This ensures that the brand strategy is commonly shared and understood throughout the organization, and enables everyone to take ownership of it. Many successful global brands follow this structure. This proposed reorganization is very beneficial for the marketing profession in Asia as a whole and will help Asian brand marketers build a reputation of being financially responsible. Shareholders and analysts are pushing companies and boardrooms to deliver on revenue and profit objectives. Therefore, the CEO must ensure that marketing expenditures deliver a satisfactory return and help drive the bottom-line. Asian brands like Singapore Airlines, Banyan Tree Hotels & Resorts, HSBC, Samsung and Shiseido have demonstrated that it is possible for Asian companies to build brands on par with those of Western countries. They have also proved the fact that a strong brand will enable companies to sustain through difficult times and sustain their financial robustness. 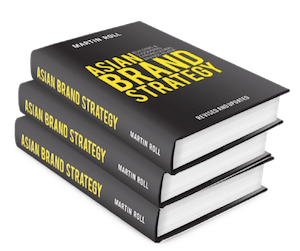 A branding drive in Asia is progressively emerging and will change the global landscape in the next decades if taken seriously by Asian boardrooms and if managed properly throughout the entire organization. As the management professor Peter Drucker once said: “Whenever you see a successful business, someone once made a courageous decision”.